A jet-set lifestyle doesn’t have to be all private planes and decadent digs. In our Jet-Set Bohemian series, we blend the best of high and low for just the right balance … enticing everyone from backpackers to luxury boutique hotel lovers to come along for the ride. Looking around the lobby at my hotel in Montevideo, Uruguay, I had a brief moment of panic. I decided a week before to set off on a three-week expedition voyage to Antarctica. I wasn’t half as geared up as the other travelers gathered around me, sporting perfectly packed backpacks, goose-down North Face jackets and footwear that could survive even the toughest of blizzards. I was still in my travel uniform of skinny jeans and a black wool sweater, hoping to survive on the world’s coldest and windiest continents by layering every winter item I owned (which for a Florida girl, isn’t a whole lot). Luckily, the concerned French shopkeeper in my now home base of Nice outfitted me with the warmest thermals they had in my size a day before I embarked on the 22-hour trip down to Uruguay’s capital. When I imagined an expedition voyage, I expected bare bone conditions and closet-sized staterooms. Stepping on board Hurtigruten’s 127-cabin 1B ice-class ship, MS Fram, these preconceived notions evaporated entirely as I was greeted by the smiling maître d’ in the dining room, who escorted me to white tableclothed seat and offered a wine list of Old World bottles. My room wasn’t suite-sized, but I had more than enough space to spread out. There was even twice daily cleaning service that included a mint placed on my pillow in the evenings. As for amenities, I could’ve left all of mine at home. Bathrooms were stocked with products crafted just for the liner, with natural extracts from birch and cloudberries grown in Arctic climates. A century ago, explorers like Ernest Shackleton traveled to far-flung corners of the globe the most minimalist way possible in whalers and even row boats, but now some of the most untouched places can be reached (and enjoyed) in style. Our days on board had all the elements of an expedition, with mornings spent getting outfitted in muck boots and life jackets in the tender pit before speeding to shore and hiking through freshly marked trails past penguins. Evenings could be as active or leisurely as we’d like, glamping on the ice-strewn continent or cozying up in the ship’s panoramic bar with top-shelf whiskey that’s been aged in barrel at sea sailing from pole to pole. And as with any expedition, courses can change just as quickly as the weather. “It’s not easy to get to Antarctica, but it’s also not easy to get out of Antarctica,” Line explained one evening after spending hours in a polar circle boat trying to find a route through a 200-meter-thick ice belt blocking the path to land on Petrel Cove. As weather worsened over the evening, the expedition team charted out a new course with the captain to Paulet Island, a spot with over 200,000 pairs of mating Adelie penguins that’s so tough to reach, the expedition coordinator hadn’t been there in 10 years. 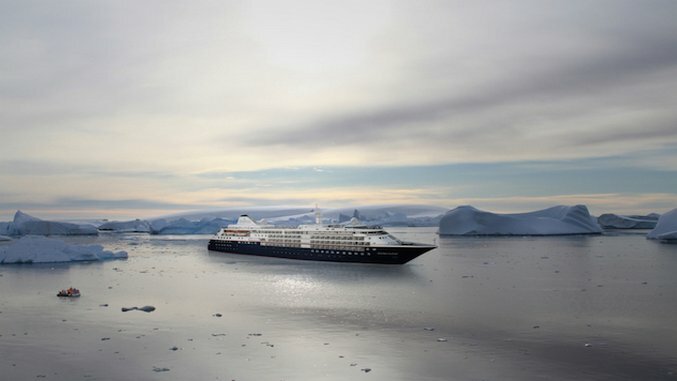 Hurtigruten makes expedition cruising look chic, but when Silversea’s Silver Cloud wraps up a complete renovation next year, it will be one of the most spacious and stylish ice vessels on the market, cruising from Ushuaia, Argentina to Antarctica. Eighty percent of the ship’s suites will sport teak-lined verandas perfect for watching icebergs and whales as you cruise by, especially while wearing the in-room designer Etro bathrobes and matching slippers. Suites also show off ocean views from panorama windows, and sitting areas feature bars designed for entertaining, made even easier thanks to on board butler service. All of the rooms are pretty lavish, stocked with Bvlgari bath products and Illy espresso machines—in addition to pillow menus and Bang & Olufsen sound systems—but the owner’s suite is like having your very own penthouse at sea. The 587-square-foot suite can expand into two rooms with marble-lined bathrooms and full tubs, as well as a living and dining room set-up that feels just as cozy as what you’d experience back home. The ship has everything from a Connoisseur’s Corner stocked with cognac and cigars to a full-service spa, but it’s also expedition-ready with 18 zodiacs and an expedition team of 19 experts ready to take you out for hikes around the Antarctic Peninsula, pointing out penguins and petrels along the way. Another destination just as untouched—and uninhabited—is the Galapagos, and Celebrity Cruises turns this expedition trip into a sailing one on board the 100-passenger mega-yacht Celebrity Xpedition. While cruising through the islands, take a seat at the aptly named al fresco restaurant Darwin’s, where you can dine on organic fare and freshly caught fish from Galapagos fishermen. One way of passing the time here is with a glass of Champagne in the Jacuzzi sitting out on the penthouse suite terrace, but the perk of an expedition in this locale (besides the picture-perfect scenery) is getting off board and exploring the Galapagos’ infamous wildlife, whether it’s on a coastal walk or below water deep sea snorkeling past rays and white-tip reef sharks.